Happy New Year! Full moon time is upon us again, with the first full moon of 2017 on the morning of January 12th. The January Full Wolf Moon invites us to open our hearts and plant seeds of intention to manifest in this new year. Set your 2017 intentions with us live on Facebook! This month is a wonderful time to focus on intentions, new beginnings, and what you want to create as we begin a fresh year. Many of you will be trying to get pregnant in 2017. If this is you, right now is your perfect opportunity to sow the seeds for the ultimate new beginning: conception. If you are not trying to get pregnant in 2017, you still have a powerful opportunity to clarify intentions for what you want to create in the New Year. Instead of making typical New Year’s resolutions, I encourage you to set mindful intentions. Resolutions focus on things you want to change, while intentions put your focus on things you want to receive. Instead of focusing your energy on what isn’t working in your life, make the powerful shift to focus instead on what new beginnings you want to create. What do you yearn for in the new year? What new relationships, projects, or circumstances would light you up inside? Let’s seize the energy of this fresh year to set some clear intentions. Our intentions, when nurtured, become powerful springboards for positive change. When we release ourselves from negative thinking, we create space to plant the seeds of our deepest desires. I invite you to carve out some time around this Full Wolf Moon to check in with yourself. Settle in to meditate. As you breathe and come into your body, ask yourself: What do I want to manifest in this new year? And in order to manifest this vision, ask yourself two more questions: What do I want to release? AND What do I want to embrace? Have your journal nearby to write down any heart messages that come to you during meditation. I would love to guide you as you explore this emotional detox work. Which is why on the evening of the 11th I’m hosting a Full Moon Facebook Live Meditation event where we’ll meditation and set our 2017 intentions together. Join us! 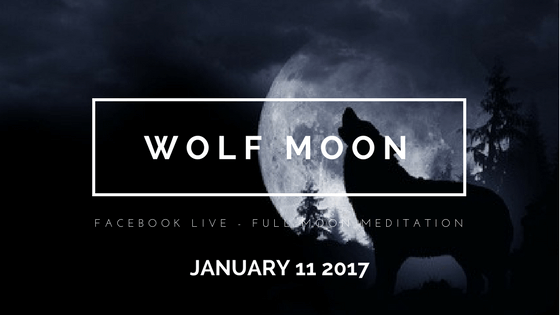 Let’s come together virtually to share in the collective energy of this January full wolf moon.